As many of you know I'm the sort of parent that gets roped into things, I seems to have an inability to say NO at the best of times, but when it's helping kids I'm even worse. The school library is the perfect example of this! Somehow since the spring I've been attending some small meetings with the head mistress, Felicity - the garden designer and the teacher who runs Eco-club. We've been talking and making plans to create a new forest school and vegetable garden area that the kids can use and enjoy. The new school was on a new site with nothing pre-existing. 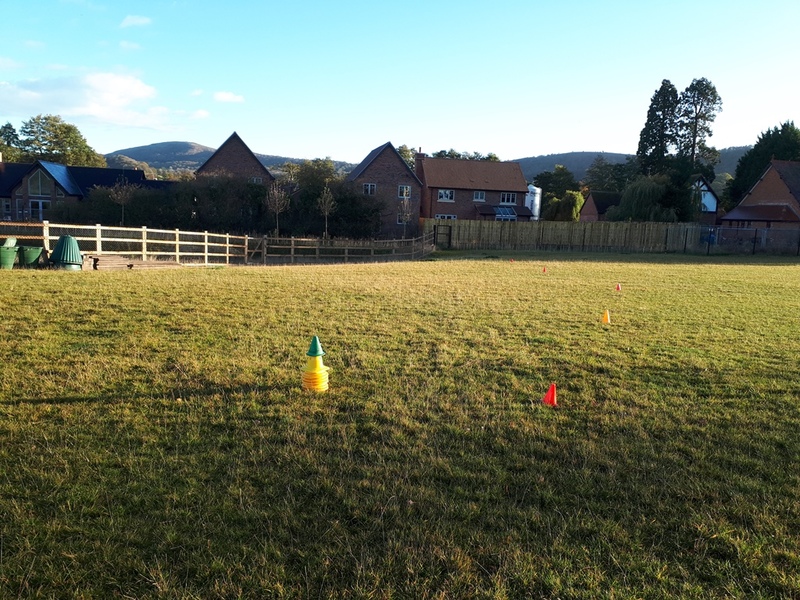 The playing field is just bare grass with a ditch down one side and pond in the one corner that has been fenced off (for obvious reason - although it will be used for pond dipping and bird watching!) The rest, as they say, is a blank canvas! A couple of weeks ago, the garden designer and I went and marked out her plans on the field. There was to be a large area of raised beds. 12 in total, making a clock face but also aligned North and South so it can be used for multiple teaching resources. 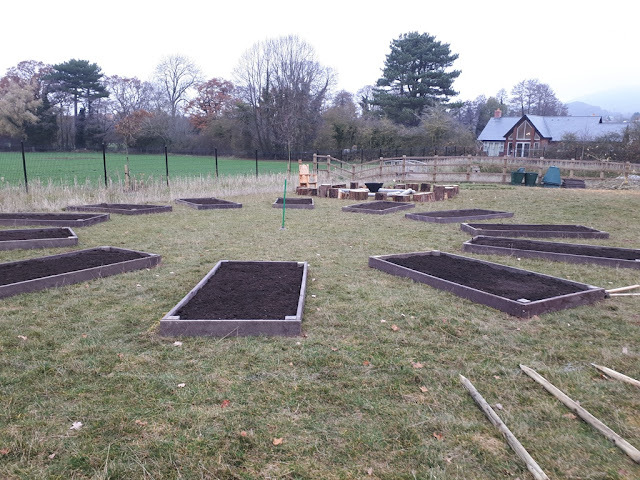 Each class will have it's own raised bed to grow fruit and veg in and some spare for clubs and other things. 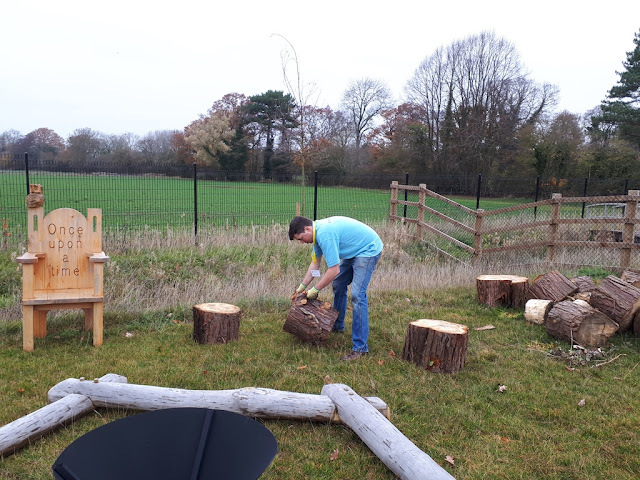 Our budget hasn't been huge so luckily we were given all the materials for the raised beds in a recycled plastic - great as they'll never rot out and it saved us so much money, the same people also donated some great logs to form a circle around our fire! 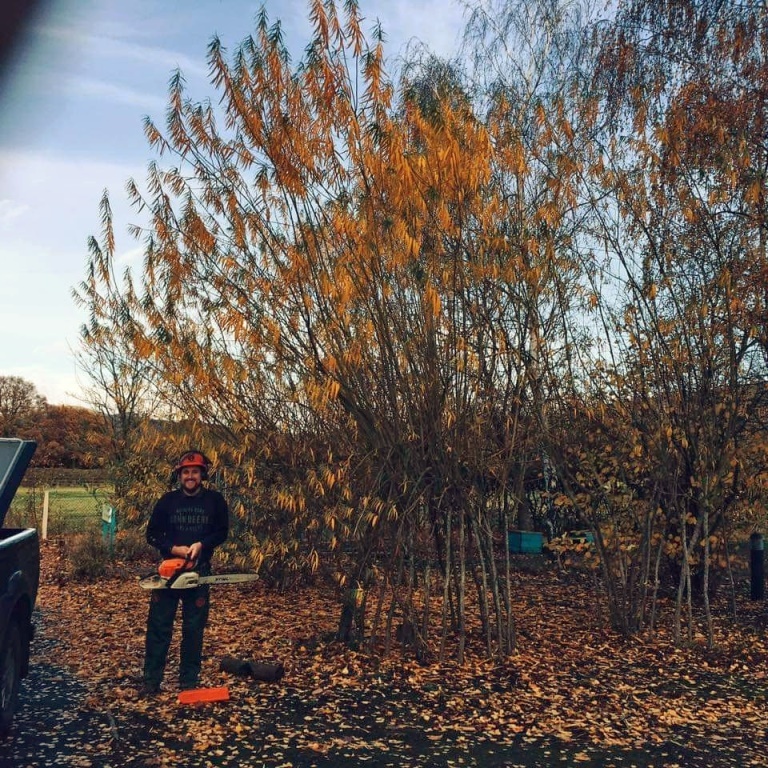 We also applied to get some free trees and ended up with a selection of cherry, rowan and birch to plant. 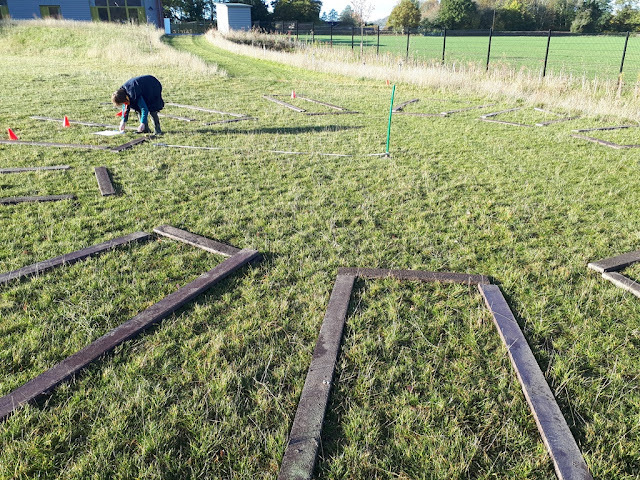 With our budget we decided to purchase some compost and fence posts, this meant we could define the area and start growing things when the weather allowed. 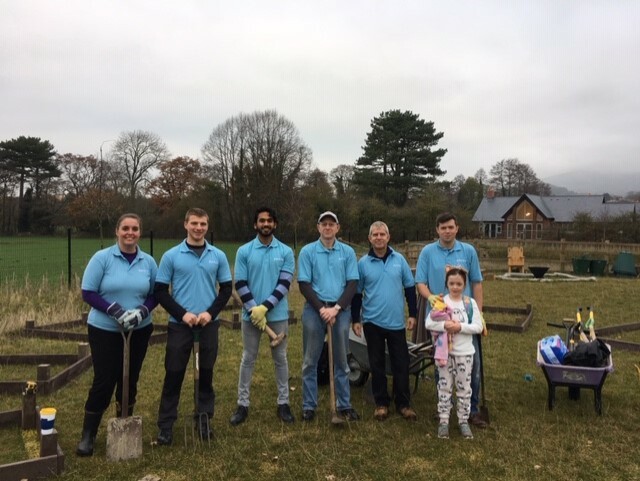 We also had a call from one of the parents who said the firm they work for (Dowty Propellers) does volunteer days and would love to come out help out for a Friday morning! This was great as many hands make light work and with 5 ton of compost to wheelbarrow up the field and lots of posts to knock in we'd need a few helpers. We also put it out on the newsletter what was going on and hoped for some parent helpers as well. Only tool for the job! So this last week has been busy getting ready. We wanted some materials to weave into the new fence so with the head and a couple of other parent we went to the old school site and cut down the old willow sculptures, really it was great to bring this part of the old school over. And on Thursday I went to school in the afternoon with a mum of one of my girl's friends and we assembled the raised beds. Screwing them together but it meant that when the volunteers turned up we had plenty to go at. 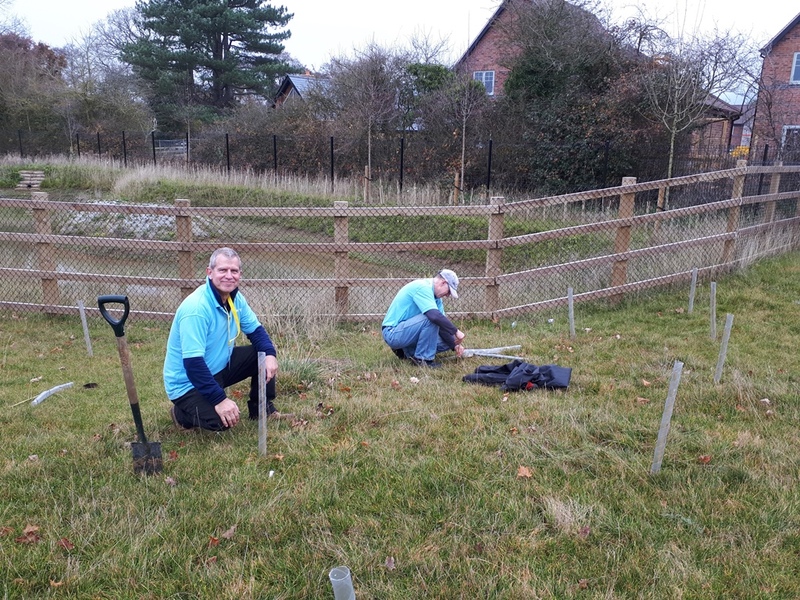 The people from Dowty were a great help! When Friday came we were ready to hit the ground running. 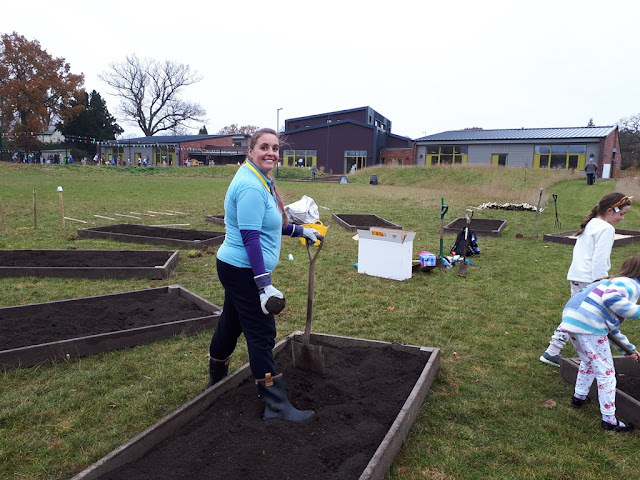 Dowty sent six strong and able people and we had four great parent helpers and the garden designer, Felicity for the whole morning. It was amazing how much we got done. The beds got dug into position and filled with compost (cardboard down first to stop the grass coming through). The log circle got put into it's new position. 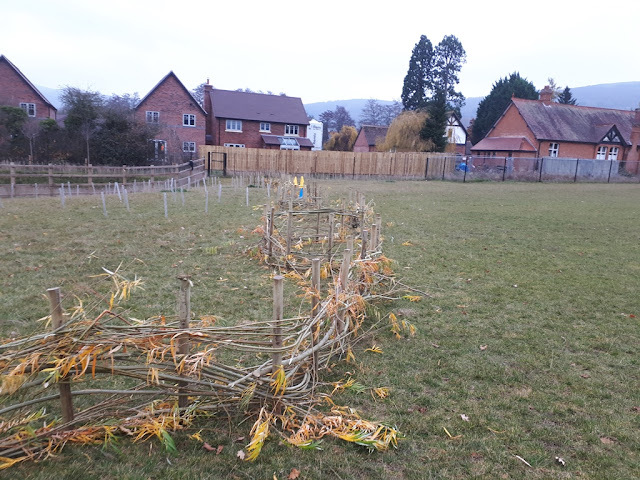 Lots of trees got planted - we had the children in Eco club come out and help with this bit as well! 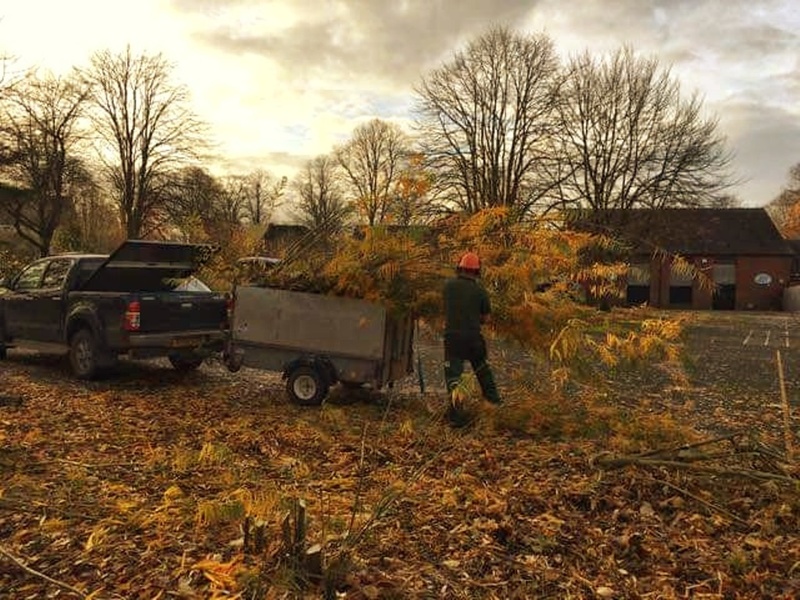 Around 130 fence posts got knocked in! I doubt I'm the only one with arms that I can't lift over my head this morning! 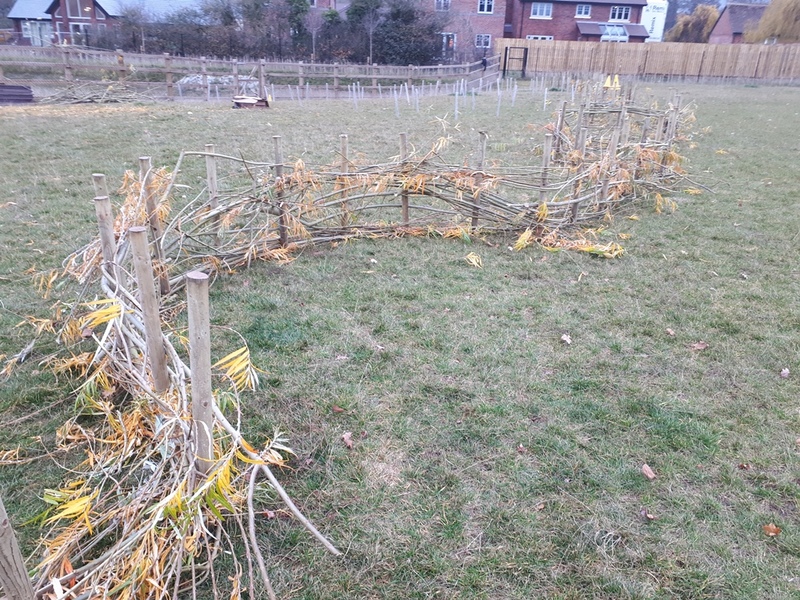 And we began to weave our new fence or dead hedge. Lots of bendy bits in it so kids can play as well as having herbs and things planted in these areas eventually. I'm super excited about this new area and everyone who helped is as well. 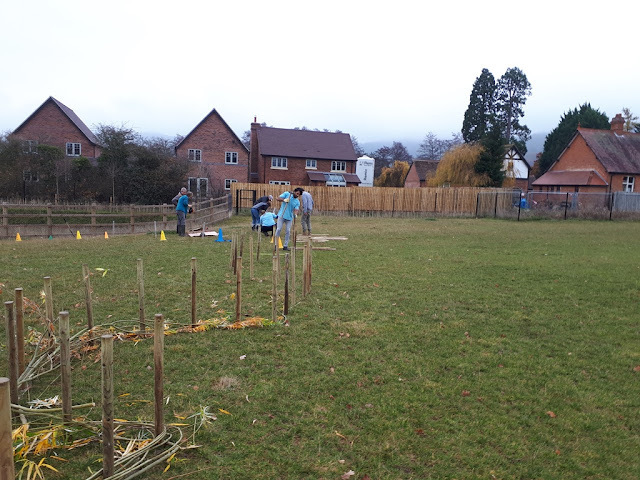 We could really see it take shape through the day and as the fence posts went in it was amazing how much it all changed. the head mistress was bouncing up and down all day, as were the children! There's also going to be a bird watching platform that needs to be built as well as lots of herbs and shrubs to be added! We're also on the look out for a tree surgeon to start leaving wood chip so we can build paths and dry areas that will be heavily trafficked by the children. This should be a great learning space for the children and help to encourage them to be outside more, it was lovely to see different groups of children come up and see the space and how excited they all were with it. So thanks to everyone who came and helped this week and thanks to my friends who helped me out with childcare with my youngest so I could get some jobs done here! I was broken by the time 3.25 came yesterday and I'm sure others were as well, but so great to see this space start to take shape. We did a smaller similar thing at our school. I was the helper/teacher of organic gardening, my husband helped with garden work. Year 3 only but they took something home each week when it was ready. On our Victorian days, we made small bread buns, butter and lemonade in a round robin style, great fun. We're hoping to get a pizza oven out here as well so should be great for some outdoor cookouts in the future. this is spectacular! what a wonderful thing to do. In a few years it should be such a great space. Fantastic job, Kev. I have been involved with school projects like this and it takes a lot of coordination and good helpers. Well done! Yeah, coordination is key! Lots of messages back and forth! This is great! I do have a construction question on your raised beds. In one pic, the corner pieces are higher than the bed edges. Later, they are leveled off. What did you do? Drive them down or cut off the tops? I'd love to do something like this in my own garden area! They were 4 inches higher. Wasn't sure what to do so decided to flip them and dig them in so it stops the beds moving a bit. Great question though and some keen eyes there! What a wonderful space for children to learn, perfect, well done to everybody. It should be so great. I'm looking forward to going in to help with eco club and plant some more fruit! Kev this is amazing! I love the look of the layout. The company I get most of my seeds from, Baker Creek Heirloom Seeds, is really active in donating seeds to projects like this. I don't know if they send overseas but it might be worth looking into. There should be some over here that would do it. I have a list of companies I need to write to and beg for stuff for the school! It looks brilliant- they must love having you as one of the parents! And the head teacher sounds amazing. So many schools do it because it sounds good and they know it's a selling point with parents but their heart isn't really in it. It's amazing what you can find time for in the curriculum if you think it's important. I think I'm going to be doing my Forest School leader qualification in the spring. Wow! Everyone obviously worked so hard. That winding fence is super cool and I must try to replicate it here on The Poor Farm. I love how the raised beds were put in a circle. They will be spectacular when everything is growing well in them. Really nice job!